We're coming to Oculus Quest! Yes, the rumors are true! This Spring, we will be releasing all 5 chapters on the new Oculus Quest headset including First Rites, Idle Hands, Skin Deep, Samaritan and The Tomb. The Quest is a truly remarkable step in the evolution of VR hardware and we can’t wait to show you just how exciting the headset can be. Make sure you’re following us on Twitter, Facebook and Instagram for news as it releases. For more information, visit Fun Train. We’ve teamed up with Gamepedia to host the official Wiki for The Exorcist: Legion VR. This wiki is completely maintained and edited by the players, for the players. Add your own pictures, videos, game guides, walk throughs, etc! Did you just get a new PSVR for Christmas? Need some help setting it up? Check out these helpful setup tips & tricks on the PlayStation site here. Thanks to player feedback we were able to identify an issue which made obtaining "The Tomb" achievement impossible (completing Chapter 5 with 100%) unless done on the first attempt. That's too hard, even for us! 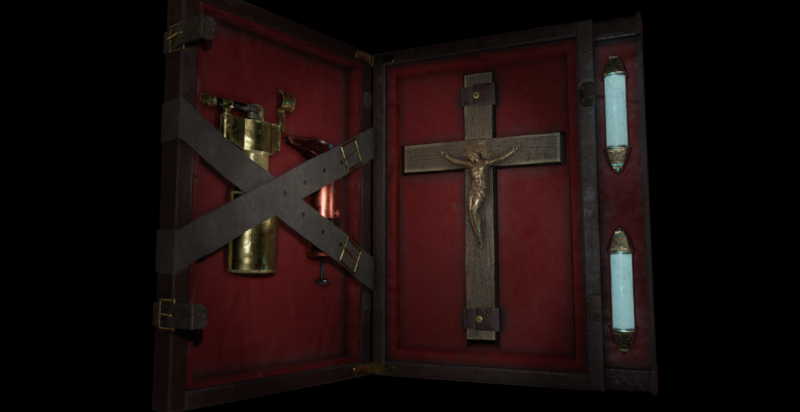 We've pushed out an update and Exorcists should now be able to make their way through Chapter 5 and obtain "The Tomb" achievement at any time, including 2nd and 3rd attempts. Who knows, you might just see something you missed before. There are a total of five achievements in Chapter 5 including "Lost Little Lamb", "Afraid of the Dark", "No Respect", "Chapter 5" and "The Tomb". Many players have reached out to us regarding the "Puke" achievement. We won't tell where the achievement is, but it is definitely obtainable, and only requires access to the police station. For some users, the game would occasionally hang when loading the calibration room. This has been resolved. The VCR is now working at the end of Chapter 4. Try it! Trophies for Chapter 4 & Chapter 5 are now properly awarded for 100% completion. Increased colliders on some objects to prevent clipping. Modified the audio mix on the Chapter 5 climax to allow users to better hear the dialogue. Occasional issues with the menu/inventory in Chapter 3 have been fixed. PlayStationVR Halloween Sales have started! Yes, you heard that right. 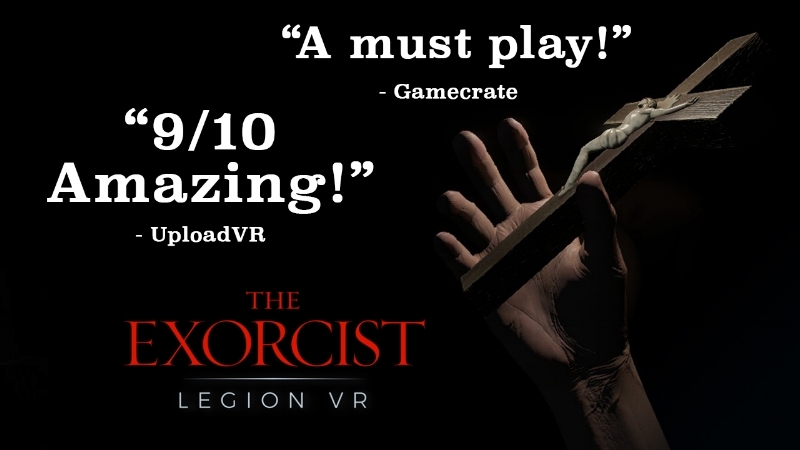 The Exorcist: Legion VR is discounted in both North America and Europe for the PlayStation Halloween sales. Get them before the sales end! Happy Halloween to all you exorcists! Chapters 4 & 5 have released for PlayStation VR! Today, Chapter 4 “Samaritan” and Chapter 5 “The Tomb” have released for PlayStation VR in North America and Europe. For those exorcists who have already purchased the Complete Series or the Season Pass, these new episodes will automatically be available to you from within the police precinct after the game is updated. PlayStation VR Upgrades + Patch Notes- Coming Oct 9th! We’ve got some good news. The PlayStation community has asked us for several changes to the game-play over the past few months, and those requests have been implemented! This patch will roll out October 9th 2018 across all territories and the new settings will be accessible via the mobile phone menu system while in-game. The game takes a variety of measurements to ensure that the world is properly scaled around you. This is an important process before Chapter 1 begins. Improvements to the calibration system with extra confirmation checks to ensure users have entered the correct information (if they are skipped, a minimum height is set so that the hands aren't at ground level). Added the ability to go back a step on the calibration scene in case you missed the instructions on the first screen. Added the ability to go back and re-calibrate player height at any time. Added the ability to switch between English, Spanish and Japanese language subtitles at any stage during the game. Want to ride the lighting? We’ve added the ability to switch off the vignette system (aka comfort blinders) via the phone menu for users who prefer free-roam movement. Increased Slow/Medium/Fast movement speeds for free roam locomotion (for all you speed demons). Added an out of bounds system to the stairs door in the Chapter 3. Added rules to prevent the player hands from triggering certain scene interactions. Added new achievements for chapters 4 and 5. Feel free to reach out to us on any of our social channels. Chapter 4 & 5 also release on PlayStation October 9th! Go forth and conquer.